LONDON--(BUSINESS WIRE)-- Infiniti Research, a world renowned intelligence solutions provider, has announced the completion of their pharmaceutical industry analysis template for a pharma company. The client is a leading pharmaceutical drugs manufacturing firm and is famous for producing medicines and developing vaccines, globally. Despite leading the market with an annual revenue of over USD 35 billion, the company was unable to devise an efficient business strategy. Therefore, the client approached Infiniti Research to conduct a comprehensive industry analysis. The client wanted to recognize business risks and opportunities to gain a competitive edge over their competitors. With the growth of the pharmaceutical industry, the responsibility of companies in the industry has increased. They have to address the complex healthcare requirements of populations without burdening them. This has compelled companies to formulate an industry analysis template to obtain detailed market insights. An industry analysis template helps companies to forecast the market demand and supply by considering factors such as drug affordability, consumer attitudes, and government policies. Request a free proposal to know how Infiniti Research's pharmaceutical industry analysis solutions can help your organization to foresee changing market dynamics and make informed decisions. 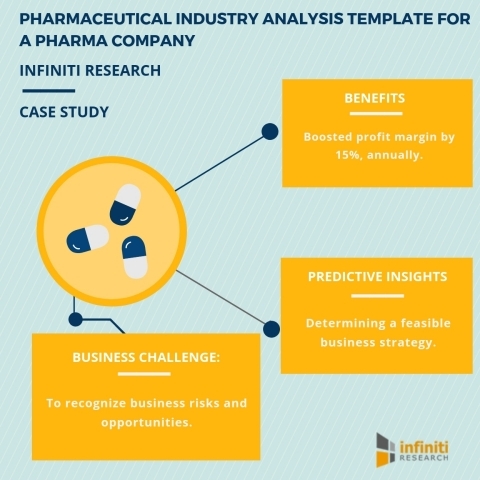 The industry analysis template delivered by Infiniti Research helped the pharmaceutical industry client to identify niche market segments. This helped them to estimate the market value of their competitors in the industry. Our solutions also assisted them in enhancing the financial health of the company by expanding their market horizons in existing and new markets. The industry analysis template also helped the client to increase their profit margins by 15% annually. Boost profit margin by 15%, annually. Discover a niche market segment. Still wondering how our pharmaceutical industry analysis solutions can help your company? Request a free consultation. Determining a feasible business strategy. Recognizing the risks and opportunities facing their businesses. Want to know more about the scope of our pharmaceutical industry analysis template? Request more information.